First of all, I got a bigger suitcase. You’d be surprised of much space baby clothes and some takes up. I bought mine from Target and I love it. One side as a net, so I can have me and him separated. Second of all, pack the day before or even a few days before. Start putting the things that you know you’ll need that can stay in the suitcase in the meantime. Pack according to the weather and bring 2 or 3 extra outfits. Here’s what I always pack in suitcase; I use ziplocks a lot of the time to separate everything! emergency bag- baby Tylenol, Camilla, thermometer, saline drops, calming tablets, little cold tablets, elderberry, echinacea. Also, little pouch for emergency booboos. click here for a handy one. bathing bag- Honest body wash, honest body cream, hairbrush, toothbrush & toothpaste, 1-2 bath toys. 1-2 books or iPad and I use Epic app that has thousands of books available. in long flights, look into jet kids! The best time we’ve found that works for us, is booking a flight or going for a car trip before Oliver’s nap and not too early in the morning where we have to wake him at the crack of dawn because most likely he’ll be super fussy. Also, we’ve started getting his own seat because it is much easier. Although, it’s also manageable completely to have them sit on your lap! The one thing besides diapers that I will NOT forget…are toys and activities! 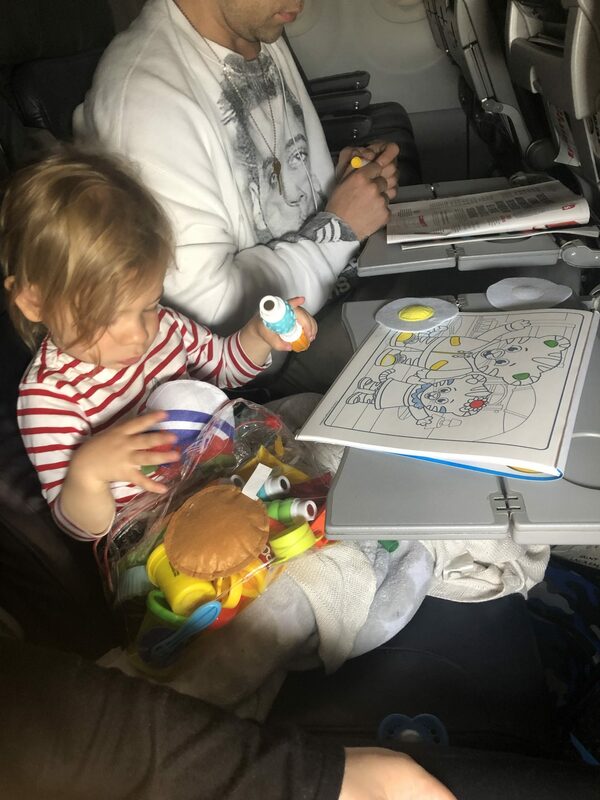 Flying with a toddler is more mental & physical because they want to be occupied and they’re very curious beans! I prepare in advance a toy bag where just pulling things out will keep him busy. I bring the iPad for us to read our offline books and watch something for 30 or so minutes. If he wants to walk and we can…off we go…if we can’t, do your magic. If it’s not working, breathe, redirect and this moment shall pass. My most challenging time I’ve found with Oliver traveling is more controlling my own mindset. I go into travel time knowing that I’m going to have to be alert, keep him busy, stay calm, accept what comes and do whatever I can for everything to go smoothly even if I’m far from feeling that internally. Something to also remind myself is that they feel everything you’re feeling so bringing yourself to a cool as a cucumber mood can help everyone involved! It has really become much easier with time…we’ve traveled so much but every trip is a new adventure and that’s alright! I’ve managed to not forget that! to check in or gate check? I also have these amazing hooks on the stroller that makes it much easier to just stroll Oliver and the extra stuff around if needed. Click here. Kyle puts his stuff and folds up the stroller if we have it with us onto the moving carpet. 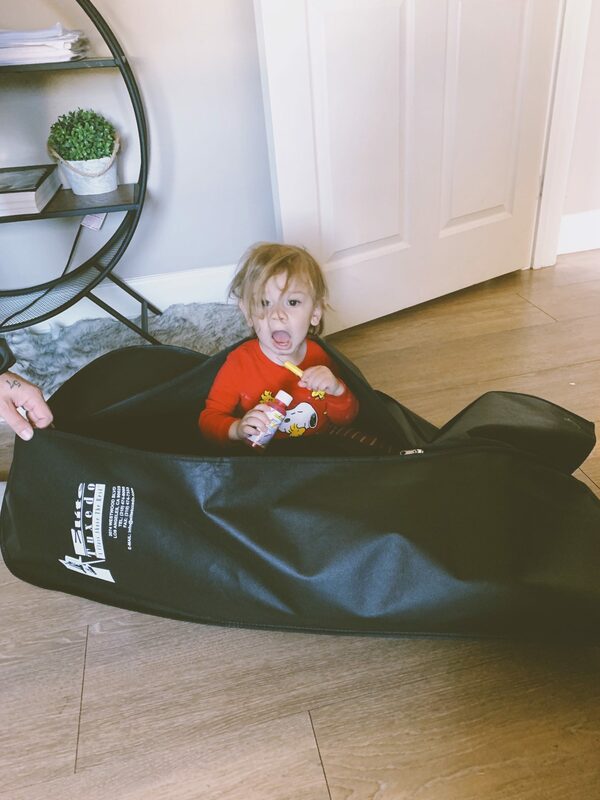 If your stroller is too wide, they will check it for you. We then wait for all my liquids to get tested, Kyle puts the stroller back together while I put everything back in my diaper bag, and Voila! Our first time, was all over the place! we were sweating and anxious….and it’s okay!!!! it’s stressful but it gets easier! I’ve also done this whole process by myself. As I’m updating this blog post, I’ve traveled to France with this little bunny BY MYSELF and not to worry because you’ll make it work. You can also ask for help. You are allowed of small bottles of water for your formula and they will test liquids. Here’s what testing means: they will take a strip over your liquid, never inside, and run it through a special machine. If you are traveling with little cartons of milk once you’re traveling with a toddler, because they can’t test it, they will most likely pat you down for extra security. A little extreme but whatever…Ive had times where they test literally everything and others where just a couple and they give me the green light. Another option if you are traveling with cow milk is to purchase it at the airport and carry empty bottles or sip cups BUT not all terminals sale bottles of milk. some have only non fat or flavored milk. which I want whole milk for my son. it’s already stressful enough for them to eat well during traveling. Great tip to get things moving faster, is to get Clear or pre checked. You can just go up to them and they’ll sign you up. You have to pay a fee, but when some airports have it, it literally saves you so much time because you don’t have to stand in line to get your ID checked by an agent. The one big anxiety factor are people starring at you. Well, I’ve noticed that with this baby boom going on, there’s always another baby on the plane! Also, I really don’t care! My mindset is that all these people that are annoyed were a baby once as well and believe me that they probably annoyed someone too! And for some it’s not just as babies! At the beginning I was very nervous about bothering people or during tantrums but as long as I do everything in my power to keep Oliver comfortable and others, I know I’m doing my part…there are moments where babies are unpredictable and that’s just human nature…and you have to give yourself a break! 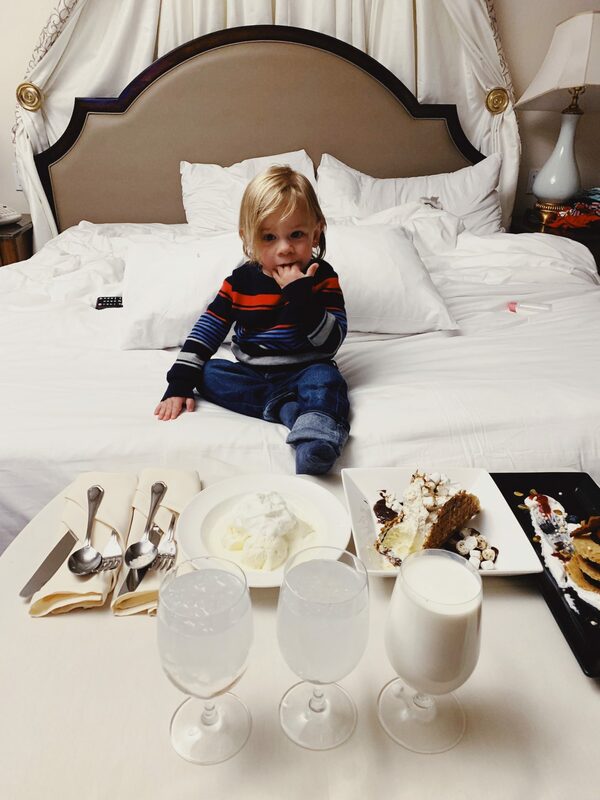 A lot of hotels have cribs that you can ask while you reserve. If you’re staying at an Airbnb, I’d think that they are listings specially for kids. You can also order in advance a pack n play from Amazon and see if someone can intercept it in advance. We mostly co-sleep during our trips but I know that’s not ideal for everyone. This time around we attempted the crib with Oliver since he’s finally sleep trained at home, but it wasn’t that easy. He didn’t quite enjoy it and cried a lot. I’m not staying in a hotel room to sleep train and I couldn’t help feeling bad for the people staying next to our room so Oliver got to spend some time in bed with us again! Here are the few things that are challenging all around for me when traveling with your babe. Unless you already live in a one bedroom apartment or studio, it’s really not easy being in the same room considering you most likely don’t have the same schedule as your kid. You have to be very quiet once your baby falls asleep and have to hope that they don’t wake up. Kyle and I enjoy watching a movie before going to sleep, so this time around we put Oliver’s crib in our little hallway in the room. The first hour he usually is in such deep sleep he could care less what’s going on around…but once he goes into lighter sleep, that’s when you better hope you don’t step on a squeaky toy or have an awful sneeze. It was the same for when we co-slept, it was even harder. A lot of good habits go out the window! Oliver is so adaptable, which is a great thing, but also a bad one because we constantly have to create new habits while traveling. New space, different hours calls for different ways to do things and Oliver picks up on them quite quickly and it can be challenging to reverse them. be patient and go with what works wherever you are. One step forward and sometimes two steps backwards. They’re going through so much and sometimes you just have to remind yourself that and pick your battles! Previous Post TODDLER IN VAIL ALERT! WHAT TO BRING.